An abandoned and decaying, large monument, formerly a shining example of Yugoslav modernist monumentalism and still quite impressive, located atop a mountain in central Croatia. More background info: for general historical background see under Croatia. The monument at Petrova Gora was erected to commemorate some organized local resistance efforts by ethnic Serbs against the militias of the Ustashe in the newly created Nazi puppet Independent State of Croatia (NDH). In 1941-1942 the resistance groups used the mountains and forests around Petrova Gora as their hideout and base for their operations. They even had a large military hospital in a secluded valley in the forest (see combinations). At its peak it was a stronghold with some 15,000 partisans. In the end, though, the Ustashe prevailed in May 1942, after they overcame the resistance at Petrova Gora. Hundreds of Serbs were killed or captured and sent to concentration camps, in particular Jasenovac. However, the secluded hospital in the forest was never discovered by the Nazis and continued to operate. The first plans for a memorial in honour of the resistance at Petrova Gora came about straight after the end of WWII, but due to economic difficulties it took until the 1960s for a design competition to take place. The chosen proposal, however, was so complex and expensive that it was abandoned again. A new competition was held in the mid-1970s to find a more practical solution. This time a proposal by Vojin Batić (whose submission had been the runner-up in the first competition) was chosen. The monument was scheduled to open in time for the 40th anniversary of the start of the National Liberation Movement on 4 July 1981. But construction fell behind schedule and that deadline was missed. However, the monument, whose interior was still not finished, officially opened on 4 October to coincide with another 40th anniversary that was actually closely connected to Petrova Gora itself, namely the opening of the Partisan hospital in a nearby valley. And the originally intended 4 July celebration was marked the following year, even though the interior of the monument had still not been completed. In the meantime Tito had died and Yugoslavia was beginning to become more unstable – which also dampened the appetite for such socialist monumentalism and pomp. So the inside of the main monument was never finalized. Yet its main structure and exterior cladding in shiny silver stainless steel plates taking the form of an abstract, undulating shape, made it one of the grandest monuments of the entire Yugoslav era. At the bottom of the grand stairs leading up to the monument, there was a large visitor centre, cafeteria, library and museum. All of this suffered during the Croatian War of Independence, when in 1991 Petrova Gora first fell into the hands of the breakaway Serbian Republic of Krajina, but was later returned to Croatia following the peace deals of 1995. Given that the monument celebrated Serbian resistance, there was now little interest, on the part of the Croatians, to do anything for the preservation, repair and maintenance of the Petrova Gora monument. And so it fell victim to looting and vandalism. The visitor centre was basically stripped bare of any usable materials. The main monument was partly destroyed too, with much of the silvery steel cladding dismantled and stolen. Today only the less accessible parts of the outer cladding are still in place, well under half of what it was originally. As if to add insult to injury, a transmission mast was erected atop the monument, further tarnishing its original glory. It also gives the authorities an additional pretext to officially disallow access to the interior of the monument. However, as you can tell from the text below, it's not that difficult to get in. When I was there with my wife in late March 2018, we had the entire place all to ourselves, and there was an opening to the side of the entrance big enough to easily slip in, bypassing the locked doors. I've been told that there is an even easier access point from the rear of the monument. However, I was also told that, at one point at least, visitors encountered CCTV cameras and guards who prevented them from going inside. When I visited the place there were no guards, but I think I spotted a CCTV camera attached to the transmission mast at the top of the monument. The partisan hospital in the forest fell into neglect after WWII but was refurbished and turned into a memorial site in 1961 and made a national memorial by Tito in 1971. 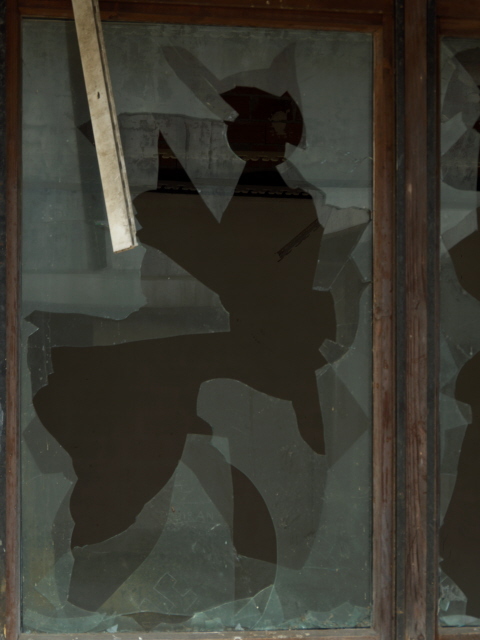 But this site too suffered damage during the Croatian War of Independence and fell into disrepair, with most of the museum items stolen or destroyed. Yet apparently funds have been made available in 2016 for a renewed restoration, though I don't know what, if anything, has become of this. 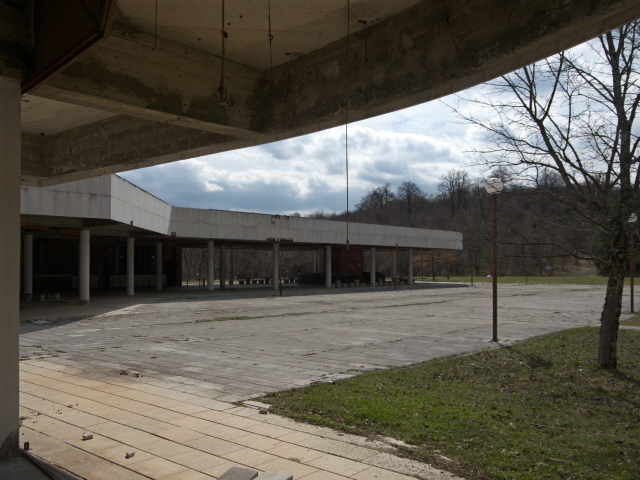 What there is to see: Starting at the former visitor centre, which has been looted bare – even the tabletops and seats of the former open-air cafeteria have been taken. It's quite a sad sight. Turning right and looking north you then come to the main approach steps towards the monument. Halfway up there is a circular, altar-like granite monument ca. 2 metres in diameter. An inscription on it in Serbo-Croat waxes lyrically about something like freedom and a “mother mountain”. Then you come to a level approach path towards the monument. Its height (37 metres) and partial silver cladding surely make it still quite impressive. But the areas stripped bare of the former shiny cladding do look quite sad. You have to strain your imagination to get a mental picture of how wow this monument must have looked when it was still intact (some historic photos may help, as you can find online e.g. here – external link, opens in a new window). At the padlocked main entrance door are two hand-written signs. I've meanwhile had these translated. 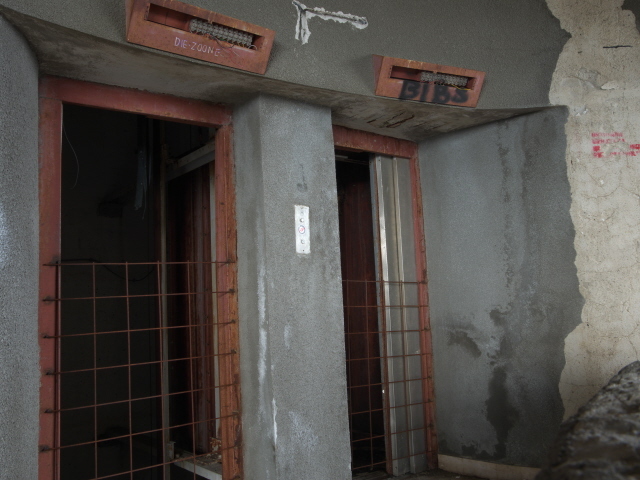 One says that keys are kept at the council offices in Vojnić (see below), the other warns that it is dangerous to get close to the monument. I presume that includes going inside. When I was there I obviously didn't know yet what these signs meant, although it wasn't rocket science to guess that they were about the inside being out of bounds nominally. Anyway, just a few yards to the right of the locked entrance there was a hole big enough to slip through with relative ease. I could not resist. 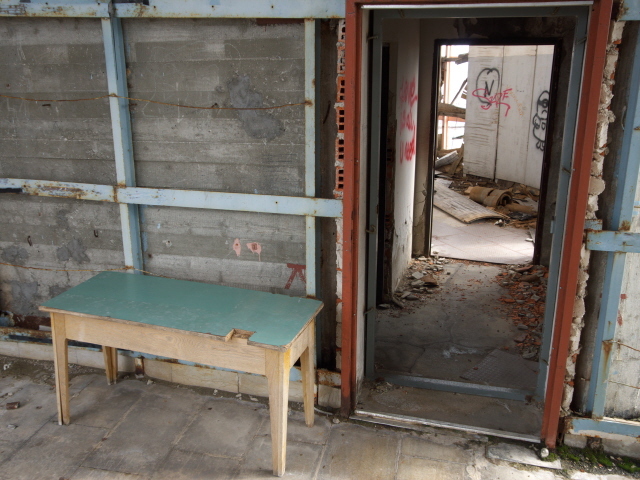 So I embarked on a spot of urbexing – and it was super cool. 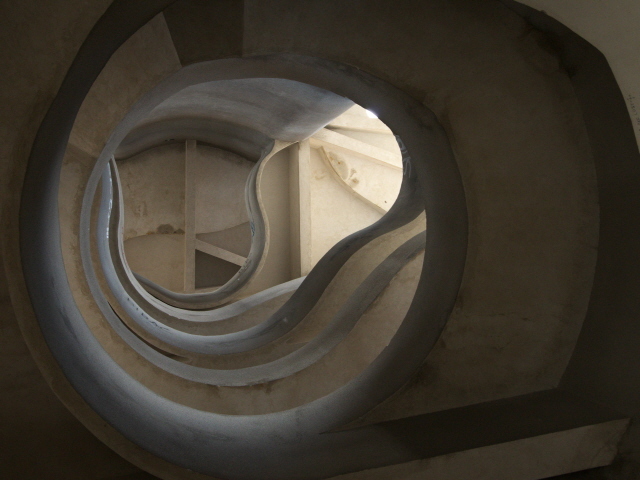 The interior may be badly damaged and defaced with graffiti, but the wonderful curvy shapes of the central concrete stairwell were magical to behold. I had to watch my step in many places, and at the door to the roof of the lower parts of the monument, or the metal floor of those overhanging bits, I resisted the urge to step onto these, as they looked potentially unstable. But the central staircase is still in good shape. There is a lot of debris strewn around. Skylight covers that have fallen from the ceiling, and there are heaps of rotting insulation material on the floor too. Often you can see straight out where the outer steel cladding has been removed/stolen, but the best view to be had is obviously from the very top. The latter is finally reached via a metal spiral staircase, then you're on the top ex-viewing platform. You get sweeping views of the mountains and the forest around the Mali Petrovac summit and over the outer parts of the monument site. Looking up at the antenna/transmission mast that's been added to the top, I thought I spotted what looked very much like a CCTV camera. I have no idea whether it was in use or not, but afterwards I decided not to linger too much longer inside the monument (there was no need, as I had sufficiently explored it by that point anyway), and rather make a swift exit. But nobody else turned up. For the entire time we were there, we had Petrova Gora all to ourselves! Cool! All in all, I found that this was one of the highlights of my March/April 2018 trip to Croatia. It's more urbex than core dark tourism, and you learn nothing about the place or the meaning and history of the memorial at the site itself. So you have to do your homework and read up about it online (e.g. on the Spomenik database – external link, opens in a new window). Even though the monument is now in a sorry, dilapidated state, there's enough of it left to make it look awesome. It is one of the largest and still very impressive monuments of that modernist Yugoslav style, so a detour to see it is very much worth the while. I've even heard it described by one Spomenik aficionado as the second best such monument after Buzludzha in Bulgaria. And that's saying something! Location: roughly in the centre of Croatia, at the end of a long and winding access road through the mountains and forests of Petrova Gora at the summit of the highest peak of the range, Mali Petrovac, some 18 miles (30 km), as the crow flies (it's far longer by road), from Karlovac to the north-west and ca. 35 miles (56 km) from Zagreb to the north. Access and costs: quite remote but not too difficult to get to; free – though the inside is officially out of bounds. Details: To get to Petrova Gora you have to have your own means of transport, ideally a car (unless you're an ardent mountain biker). NOTE that GPS navigation devices as well as Google Maps routinely suggest routes that involve tracks that aren't suitable for regular passenger cars (you'd need a 4x4 jeep), namely on the eastern slopes of the mountains via Podgorje. These are only forestry tracks. Don't use them. Instead you have to take the route from the west, starting at Vojnić and via Radonja. Just after Radonja is also the turn-off for the hidden former partisan hospital. Carry on after Radonja straight ahead and into the forest and mountains – follow signs for “Spomenik”. You'll come to a crossroads at a restaurant/hotel/mountain resort. Carry on straight across here. The road starts climbing now along some sharp switchbacks. After a clearing you come to the last stretch of road and suddenly the monument is right there. I suggest parking not at the first opportunity when you come to the open space in front of the monument, but to carry on further round the bend and then park behind the former visitor centre on the little loop road to its east. That way your vehicle will be sheltered from view for anybody coming up the approach road. From there you can walk through the old visitor centre (and explore this first if you like) to get to the bottom of the main steps towards the monument. WARNING: nominally you're not allowed to enter the interior of the monument, as signs (in Croatian only, though) inform you at the locked entrance door. However, it's not difficult to find a way in. But technically that could be seen as trespassing. It's also not without risks. The stairs inside are still in pretty good shape but other parts of the monument are not, so you have to watch your step carefully and avoid the parts that look unstable. Plus there is the risk of bits falling from the ceiling, as all the debris on the floor indicates. And if you somehow get hurt inside the monument, your travel insurance may not cover you. So be aware that exploring the inside is entirely at your own risk. I do not accept any liability. Time required: not long, just 15-20 minutes or so, if you're content with just viewing the monument from the outside; if you want/can venture in, add at least 45 minutes extra exploration time. Combinations with other dark destinations: The forests of Petrova Gora hold another secret: that partisan hospital (see above), hidden in a steep valley a few miles south-west from the monument. This consists of a number of wooden houses (restored in the 1960s, so not original), a partisan graveyard of those who succumbed to their injuries here (i.e. those the hospital couldn't save) and a few memorial markers. However, I didn't manage to find this. I had the co-ordinates and thus knew roughly the location, but my GPS failed to follow the co-ordinates and claimed I was off-road and sent me straight past the area where the hospital supposedly was. I could have tried parking somewhere and started searching on foot, but I was already a little pressed for time so I gave up. Others had more luck, going by the photos I found online. Oh, well. The nearest other dark site that has a chapter on this website is the Homeland War Museum in Karlovac, a ca. 45-minute drive away to the north-west. From there it's also not far to Zagreb. What looks fairly close on a map but isn't in terms of routes and driving time is Jasenovac. It's 55 miles (90 km) as the crow flies, but over 90 miles (150 km) on often rather slow roads (unless you take the even longer detour via Zagreb) so that it takes well over two to three hours to get there. In general see also under Croatia. Combinations with non-dark destinations: The location of the Petrova Gora monument is also a beauty spot in a nature reserve, so it's not all dark, far from it. Further afield, Croatia's No. 1 tourist site, the Plitviče jezera (lakes) and National Park, are only a 50-mile (80-km) drive away that takes roughly between an hour and an hour and a half. See under Croatia in general.